Natural Vitamin C is blended from real organic fruit extracts of acerola, amla, lemon and rosehips. Taken regularly, it helps support the immune system with one daily serving delivering 250mg of vitamin C, 312% of your daily allowance. 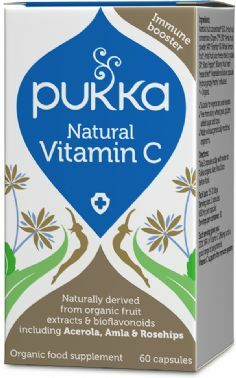 Pukka Natural Vitamin C is 100% naturally derived meaning that it delivers high levels of absorption and stays in the blood for up to 12 hours, far longer than the bio-availability of most industrially processed vitamin C products. Take 2 capsules 2 times a day with some water or Pukka Organic Aloe Vera Juice before food or between meals. Seek professional advice during pregnancy. Acerola fruit 18:1◊ (78%), amla fruit, amla fruit juice fresh freeze dried 30:1◊, rosehip(4%), whole lemon fruit (3%), bilberries fresh freeze dried 15:1◊, black pepper. Vegetable cellulose capsule. ◊ Ratio = concentration of fresh plant dried to powder. 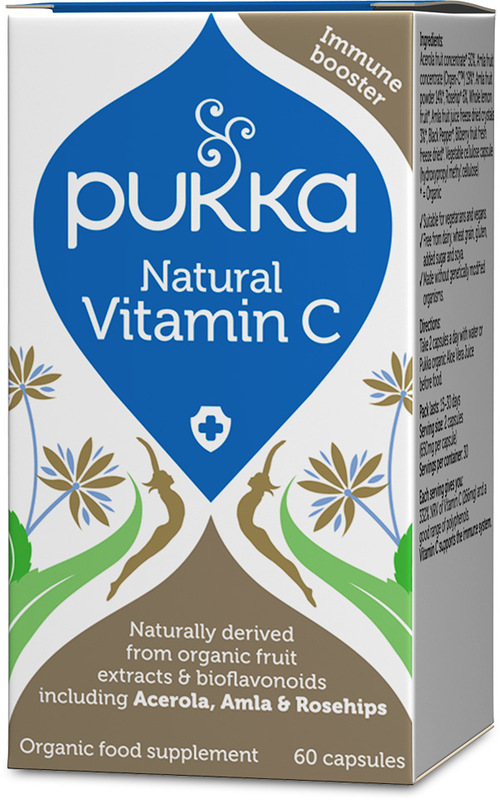 Pukka Natural Vitamin C is certified 100% organic by the Soil Association, ethically sourced and is suitable for vegetarians and vegans.